I’m new to the Blender and have completed the tutorials on Beginning Modeling found at the online wikibook. Please assist me with any feedback on my model. Thank you for your help. The modeling looks very good. The design could use a little rethinking, as it looks overly vulnerable to jamming the treads or attack from the rear or sides. The lack of clearance under the chassis would give it problems moving on other than paved surfaces. Nice detailing, though. Most Blender beginners don’t do half so well. Many thanks for your advices/comments! Orinoco: Of course, you’re right. I was so busy with the modelling, that I forgot the structure. Anyway, I’m trying now to make it better. That’s a really fantastic model, especially for a beginner!! Are you going to add some textures when you’re done with the model? You are looking perfect. Now start UV the next step. hes modeling it off of a series of warhammer 40 vehicles… with a few of his own twists to it… as the normal rhino dont have twin las cannons on the side. my only complaint so far are the holes in the treads… that would NEVER happen… treads HAVE to be solid pieces because of all the weight they move… holes in them like that would greatly reduce the weight they could move before breaking. the smoke casters seem a bit small… otehr then that all it needs is some texturing and some added details like some railing… barbed wire… spare gas tanks or spare treading hanging on the hull to make it stand out more apart from the default models. thats very good but i do see a some design flaws that would prove catastrophic on the battlefield. first are the theads, they are exposed in the front! 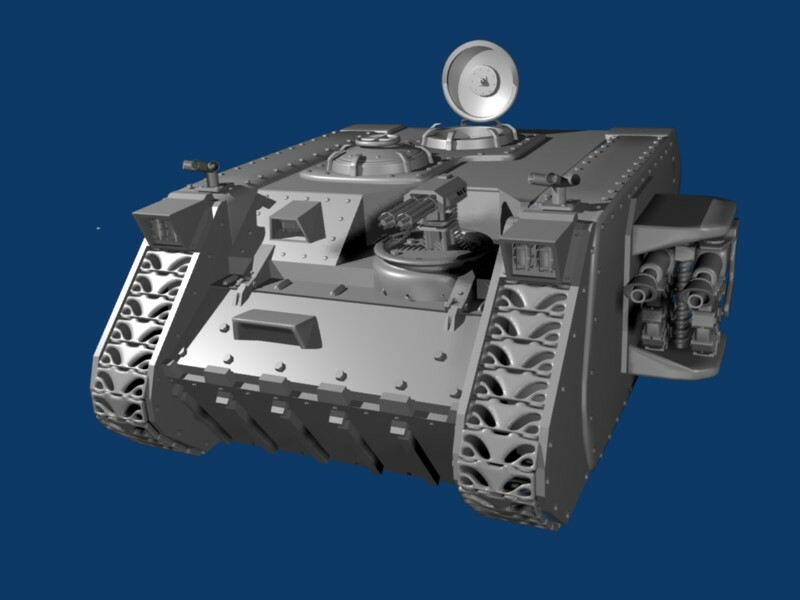 in any tank or apc the front is natuarly the most heavly armored part of the vehicle. this is so it can withstand head on attacks while it charges and it can afford to smash through walls, small trees, and other light obstacles. your tank is an easy target on all sides and has little ground clearance due to the low hull. it looks like a flawed version of the m113. it looks great, i didnt do half that good when i first started.